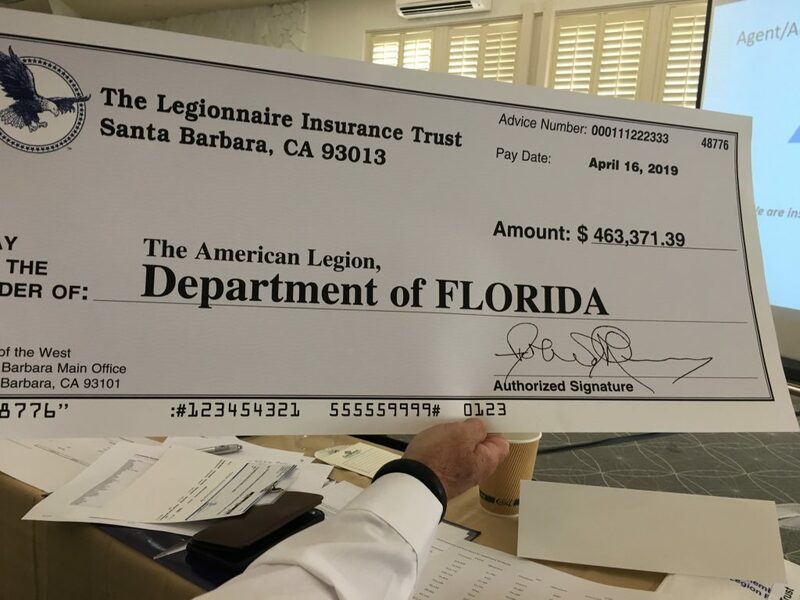 Legionnaire Insurance Trust (LIT) has been a long-time partner to the American Legion, Department of Florida. We are grateful of their support and service to our veterans and their families. So far, it has been an exciting year for the 16th District. As the largest District in the Department, membership is always a challenge but the Posts in the 16th District have welcomed the challenge and are on their way to meet and exceed their numbers for 2018-2019. I would like to give special mention to a couple Posts that have taken the membership challenge and have performed above and beyond expectations. First, I would like to thank Post 46 who is at 187% as of February 14th. They have exceeded my expectation in growth, not only in membership but throughout the entire Tarpon Springs community by reaching out to the city government, churches, social groups, and schools. Post 46 has put their old nickname of “Ghost Post” behind them and transformed to a Post that is now considering expanding by creating both Sons of the American Legion and Auxiliary Charters. During this time of expansion, they have also started a Boys Scout Program. Congratulations are also due to Dunedin Post 275 and Commander Sid Damsgard. Post 275 continues to grow, and they recently passed 101% membership this year while representing and promoting the Four Pillars in their community. Job well done Post 275! Currently, the 16th District is in 3rd place in the Department. I am proud of all the hard work the Posts of the 16th District are doing in membership. We are working hard to communicate with our Sons and Auxiliary on a monthly basis. The District staff has worked hard, participating in Staff Huddles at least once a month and meeting on Fridays for “Social Hours” at different Posts within the District. These events provide an opportunity for coordination of calendar events and fellowship. Our District Oratorical Winner is Joseph Corley from Post 79 and will be in the Central Area Contest on the 23rd of February at Cross Bayou Post 252. The District has also been recognized in Social media on the Department and National stages. Our social media presence has increased by over 300% in the last eight months and is averaging 2,000 unique visitors each week. In closing, it is with deep regret that I announce the passing of Commander Walter Hartshorne, long time Post Commander of Post 343 in New Port Richey, FL. Walter “Wally” Hartshorne was born in New York on January 23, 1930. He was an 89-year-old Korean War Army veteran and a 61-year member of the American Legion. He transferred from Post 1011 in New York City on October 23, 1993. RIP Wally!! TALLAHASSEE – Gov. 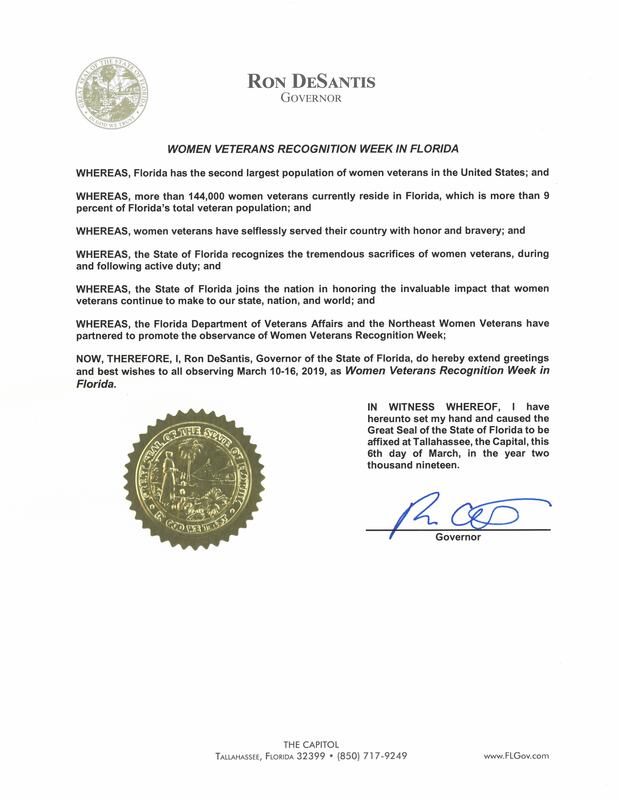 Ron DeSantis has designated the week of March 10-16, 2019 as Women Veterans Recognition Week in Florida. Women veterans are one of the fastest growing segments of the veterans’ population. There are more than 144,000 women veterans in the Sunshine State. For more information and resources for women veterans, visit http://floridavets.org/our-veterans/women-veterans/. 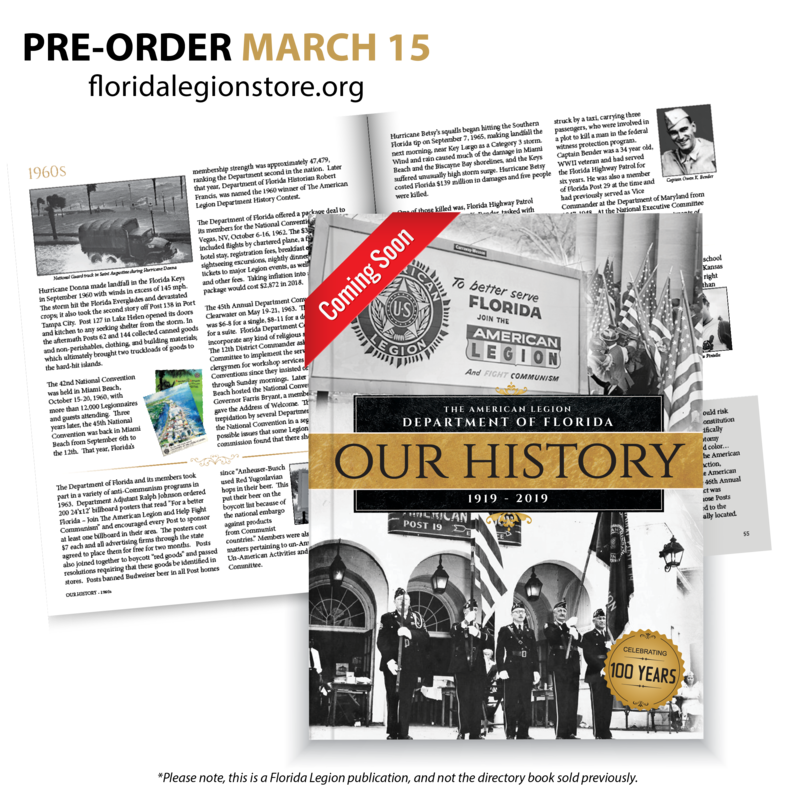 In order to maintain a charter, each Post in the Department of Florida shall participate in at least one recognized program of The American Legion each year, Article X, Section 10c. All post must complete a National CPR and the Department Addendum, or will be subject to review and possible revocation of charter. 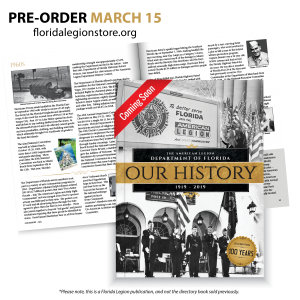 In celebration of our 100th Birthday, The American Legion, Department of Florida is proud to announce “Our History,” a full color book of Florida Legion’s history from 1919 to 2019. More information will be available soon. Pre-Order your book starting March 15, 2019.